logokas Wrote: Xion build 108 beta is now officially confirmed to work on Windows 7 Beta 1. A note to you Vista people. This should all hopefully be fixed with build 109. You shouldn't have to run as Admin anymore. Xion will now store your settings in the Documents and Settings path. This of course means that you'll have to shift your skins, but at least now installing skins, deleting them, changing settings, etc should work on all OS. I've tested here on Vista and Windows 7 and everything seems to be working smoothly without running as Admin. The only thing that will need Admin is registering file types. I've now added full UAC support. If there is a command you need to perform, Xion will ask for Admin access and perform the command. A small UAC icon is displayed next to the button or command so that you know it will ask you for access. The main screen that this applies to is the File Types Tab. logokas Wrote: When oh when will you also put in the 'associate all' button? So i wanted to use the playlist today, and when i opened it, i was greeted by a black hole of doom. All graphics were displayed as solid black, rending the playlist simply as a completely black box. The black box was not interactible other than it could be moved by every point you grabbed it at. Resizing was not possible. I do not know how to reproduce this, though i have been installing a fair bit of skins. The beta was installed freshly, on a fresh Windows XP SP3. Xion has also been running for roughly 6 days now, which may also be the cause. EDIT: I restarted Xion to see the effect. It did re-reveal the playlist, but only partially. It looks like Build 108 is one of the buggiest builds we've seen in a while, eh? 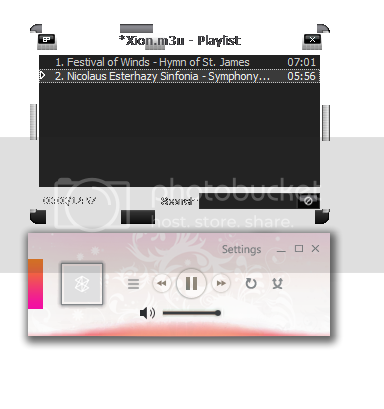 Also there's a ton of unicode related errors that show up when using Play in Xion on a folder to generate a playlist of said folder, which generates the now semi-fixed error that would usually show the VS Runtime Error, but instead now displays that awkward error box. Hurr. I'm fairly sure all of these issues have been fixed for build 109. The playlist was attemping to load a skin when it shouldn't have bothered, leaving it with a dead interface. I've also fixed the errors with Play in Xion. And yes, build 108 is quite buggy as it was the major change from Multibyte to Unicode along with some larger system changes. Of course I can't test for every single case, that's the reason I release the Beta's so you guys can help me find them! Hello Cliff, i like the new taskbar feature, but can you make it in 109 build that we can choise in options that only taskbar, system tray, or both to show. And another one, it will be nice that we can minimize (hide) player from task bar too. Cheers, and i love the player. I've changed the functionality of skin packs slightly so that when you load a skin pack, it will look for playlist AND normal skins, when it finds them it will apply them. Makes it much nicer so that you don't have to choose first the normal, then the playlist. Joymax Wrote: Hello Cliff, i like the new taskbar feature, but can you make it in 109 build that we can choise in options that only taskbar, system tray, or both to show. And another one, it will be nice that we can minimize (hide) player from task bar too. Cheers, and i love the player. build 109 will feature some more options for the Right click of the taskbar button. In the future I'll see about displaying the Xion menu in there as well. What's with the sudden surge of people who want to waste taskbar space that badly? I mean seriously what is this, the widescreen 'era', now? logokas Wrote: What's with the sudden surge of people who want to waste taskbar space that badly?